Looking for a super fun, NO PREP activity to review telling time in Spanish with your students? Play this Jeopardy-style trivia game with them! Students will be engaged as they work in teams to answer questions in the following categories: ¿Qúe hora es?, Los Números 1-30, ¿Dónde está el error?, Translation, and Un Poco de Todo. In addition to the traditional point value questions that start at $100 and get increasingly more difficult as students work their way up to the $500 questions, there is also a bonus ‘Make a Wager’ option for each category that is like Final Jeopardy. 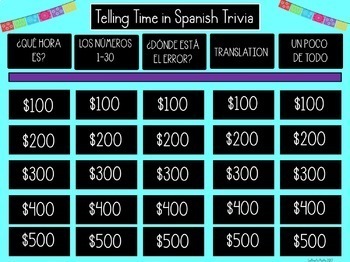 This game is included in my money-saving Spanish Jeopardy-Style Trivia Games BUNDLE #1 which has 10 of these fun games at a savings of 25% off the list price! 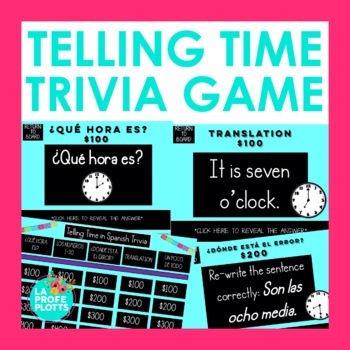 Click the link to see it!Need another telling time in Spanish activity? This resource pairs really well with my best-selling Telling Time in Spanish Task Cards! Click the link to see them!